It's the beginning of the zucchini season. Already I've been lifting prickly leaves to see what they're hiding. It's the time for big blousy yellow zucchini flowers which can be picked, stuffed with cheese, dipped in tempura batter and fried. Such a decadent, glorious snack. Beside the flowers are the zucchinis themselves. Already there's a selection of sizes, from the sweet finger-sized growing babies to those thick and the length of a forearm, that have been hidden under the leaves and in what seems like no time at all, allowed to get a bit too big, to become marrows. 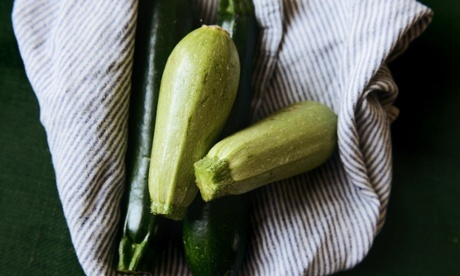 It's zucchini season.Photograph: Lauren Bamford/Supplied. Zucchinis come in many shapes and colours, not just the long, dark green varieties commonly found in the supermarket. They can be round and a pale green, or nearly black or golden. Be careful of overcooking - a zucchini can easily turn to mush. You don't need to treat them gently, just quickly. Grilling slices over high heat or over a smoky barbecue slathered in olive oil and salt is delicious. This recipe is a great one for those marrows that have been picked when they're past their most succulent. A zucchini cake is another wonderful way to deal with a marrow. Cooked in much the same way as a carrot cake, and just as delicious, they require cups of grated zucchini. The fritters are light and fresh-tasting, perfect served hot as a cocktail party snack or at the beginning of a dinner. Crispy on the outside with the salty, creamy bites of feta at their centre. They are a tantalising appetiser. But if you make a little extra, I also like the leftover fritters cold and a little stodgy from the fridge. 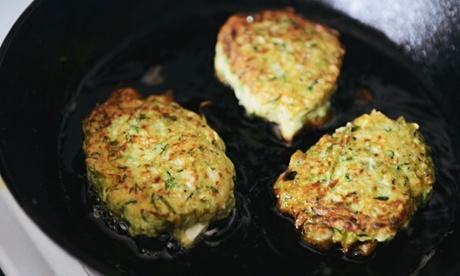 Zucchini and dill fritters.Photograph: Lauren Bamford/Supplied. Press the grated zucchini into a colander, over a bowl, with a pinch of salt, to remove the excess liquid. Leave to sit for five minutes, then squeeze the grated zucchini to make sure it's as dry as possible. Mix the egg yolks with feta, salt and pepper until combined. In a separate bowl whisk the egg whites until stiff. Add flour, almond meal, dill and zucchini to the feta mix. Mix well. 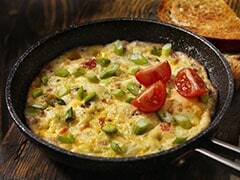 Heat a heavy bottomed frying pan with1/2 cm of olive oil in the base of the pan. While the pan is heating, fold the stiff egg whites into the feta-zucchini mix. When the oil is hot, place a spoonful into the pan for each fritter. Don't crowd the pan. When golden, turn. When both sides are golden remove fritter to a paper towel. 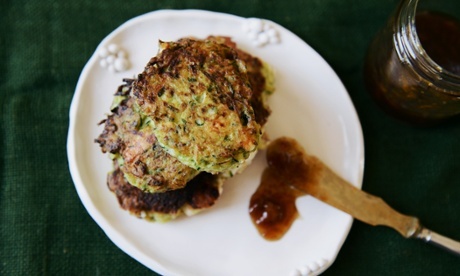 Fritters are the perfect party snack.Photograph: Lauren Bamford/Supplied. 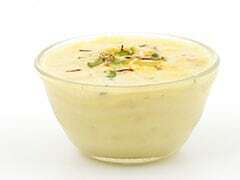 Serve immediately with chutney or a cumin yoghurt dip. 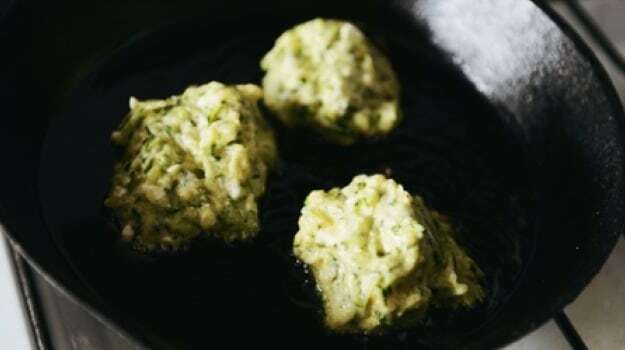 Zucchini and dill fritters - tasty hot and cold. Photograph: Lauren Bamford/Supplied.